LG Electronics India has launched its flagship offering of the year, the LG G4. The high-end smartphone, unveiled by Bollywood superstar Amitabh Bachchan, is priced at Rs 51,000 in the country. The device was selectively launched in April across select markets as the LG G4 Dual SIM (Dual LTE). The Korean company's smartphone, which is a successor to LG G3, features a leather back and sports a 5.5-inch QHD (2560x1440p) IPS Quantum display. It has dual-SIM and dual-LTE support. The device is powered by a 1.8GHz Qualcomm Snapdragon 808 hexa-core processor and comes with 3GB of RAM. It houses 32GB of storage and a microSD card with expandable storage support up to 2TB. The smartphone boats of a 3000mAh removable battery. It offers 100GB of free Google Drive storage space for two years and native gallery, music, and file explorer apps have Drive integrated into them. The G4 features a 16 MP rear camera with f/1.8 lens and an 8-megapixel front camera (with f/2.0 lens). The rear camera has DSLR features and has improved image stabilisation. With a feature called Quick Shot, users can take pictures by double tapping the phone's rear key while the display is off. LG G4 runs on Android 5.1 Lollipop out of the box and sports LG's new human-centric UX 4.0 interface. Its Smart Notice feature provides more personalised notifications for weather, travel and more by analyzing habits, such as how a user commutes to work. 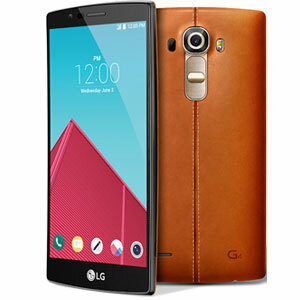 In terms of the competition, LG G4 would lock horns with flagship products of Apple and Samsung. It would compete with iPhone 6, Samsung Galaxy S6, and HTC M9+.